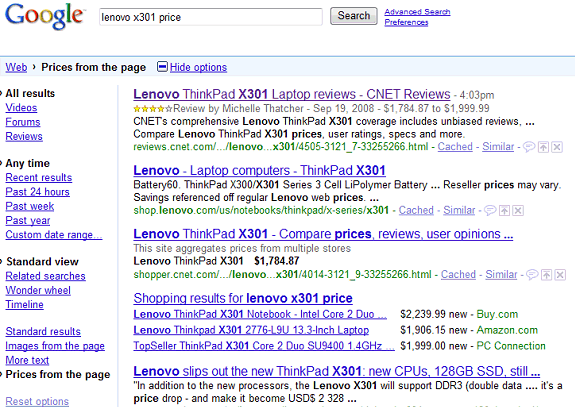 Google added a new option for customizing search results snippets. If you want to buy a product and you're interested to find a good price, click on "Show options" to enable the search options sidebar and select "Prices from the page". Google will show the same search results, but price comparison sites like PriceGrabber, Shopping.com, Shopzilla will include a message above the snippet: "This site aggregates prices from multiple stores". 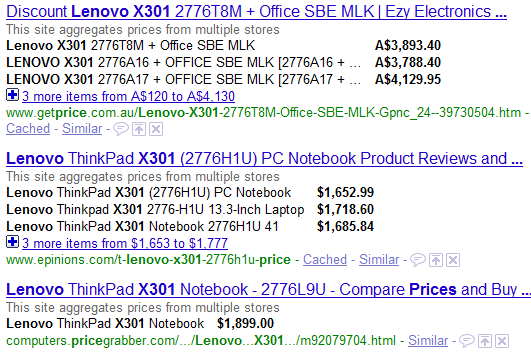 Snippets have a different formatting: a list of products and the corresponding prices. The feature would be more useful if Google allowed you to restrict the results to price comparison sites and if the results were better formatted, for example sorted by price. It's also surprising to see that Google doesn't integrate the results from it's own price comparison site, Google Product Search. Great, profits both Google and the really worthwile sites. That's exactly what the customers need. This will open new marketing doors for real products. It's an interesting feature, but I am seeing it pull incorrect "prices" from pages. For instance, I'm seeing it mis-represent cash-back/rebate amounts as the price of the product. I'm wondering if using their pricing microformat would help. I'd like to know how the second example is pulled together though. I've seen it on websites that don't support rich snippets.